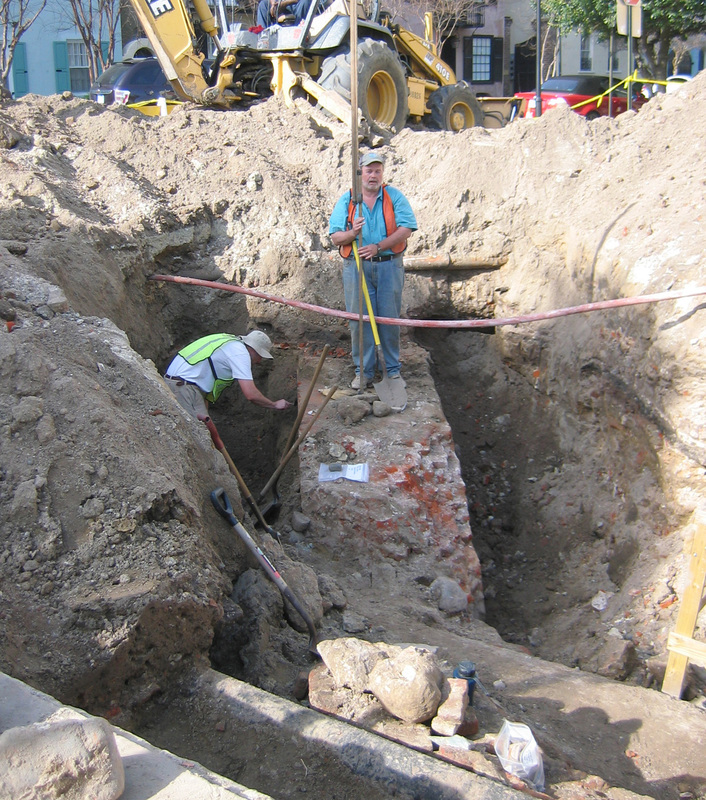 The excavation of the soil around the north flank of the brick redan wall continued to be the most exciting development at South Adger’s Wharf today. 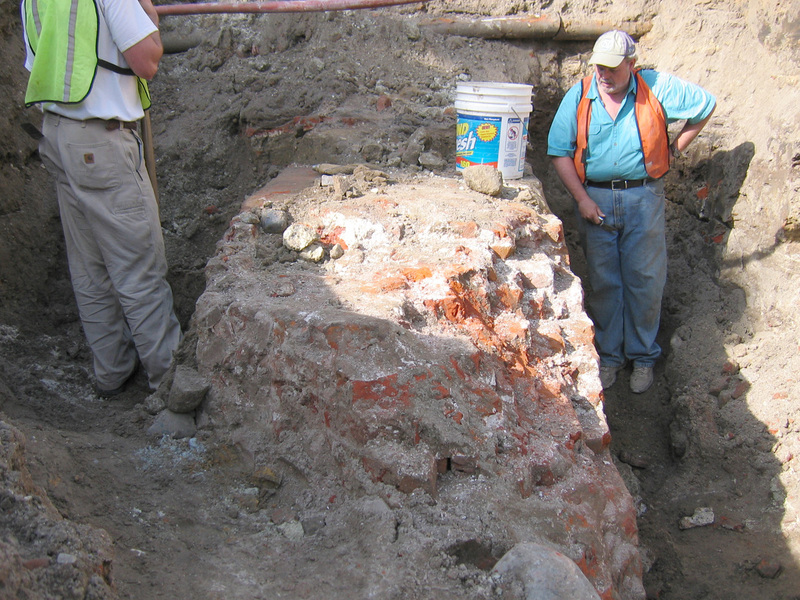 Continuing the work started yesterday, archaeologists Ron Anthony and Andrew Agha chased the line of the wall towards the northwest (towards East Bay Street). After several hours of careful shovel work, they succeeded in uncovering a few more feet of the wall, but the presence of an active natural gas line prohibits any further movement in that northwestward direction. Despite this obstruction, however, they uncovered sufficient amount of the redan wall to form a hypothesis about the curious structural characteristics noted yesterday afternoon. The first part of the redan wall uncovered earlier this week is five feet wide with an outward slope on the outer face. Yesterday we discovered that the northwestward continuation of the wall is only three and a half feet wide (not four feet as reported earlier) and is not sloped on the outer face. After uncovering another meter of the wall, it became clear that this part of the wall, the western end of the redan’s north flank, is consistently flat on the outside and three and half feet wide. Since these features appears to be more than just structural anomalies, the archaeologists and historians put their heads together to come up with a theory. We’re currently thinking that the eastern end of the redan, towards its apex, is thicker and flared outward in order to provide additional support for the brick set into the original tidal mudflat, and to help protect the redan from the ravages of storms. We’ll work on sketching a visual representation, but in the meantime it might help to imagine that the apex of the redan looks like a cross between an arrowhead and a cowcatcher on the front of an old steam locomotive. 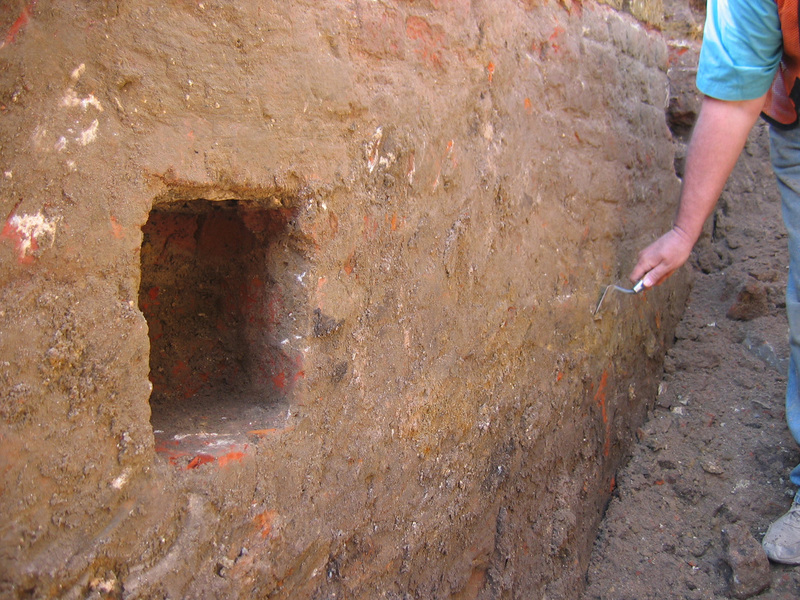 In addition to that structural curiosity, Ron Anthony’s trowel discovered a small void in part of the outer face of the redan wall. It appears to be a small square, less than a foot on a side, that is only about eight inches deep (don’t worry, we’ll take accurate measurements soon!). What was the purpose of this cavity? Was it a notch left for a beam? Was it a step used by brick masons climbing the outer face of the wall during its construction three hundred years ago? Hmm. Any ideas? 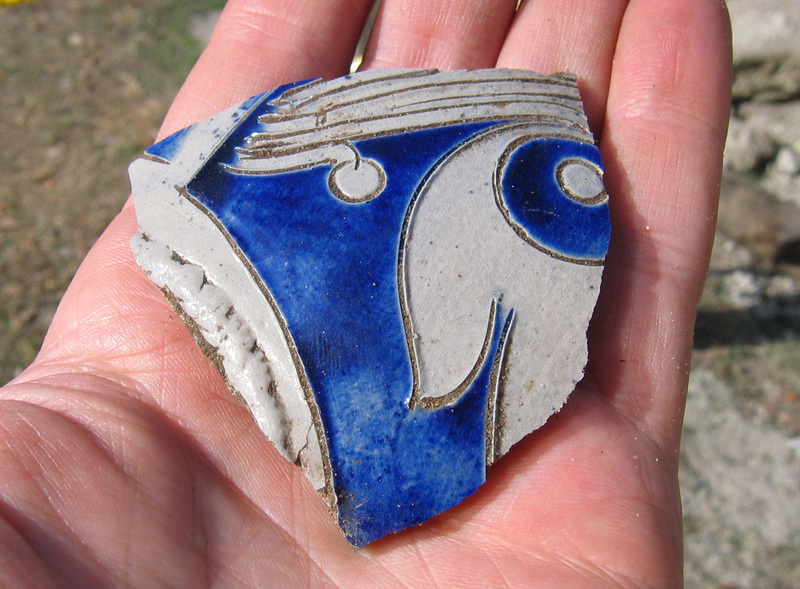 Volunteers have been screening dirt for artifacts every day and finding beautiful old pieces of the past. We don’t have time or space for a full gallery of the objects, but today I’m offering images of two of my favorite finds from today’s screening. I’m afraid I can’t identify their type or age—I’ll leave that up to the archaeologists! 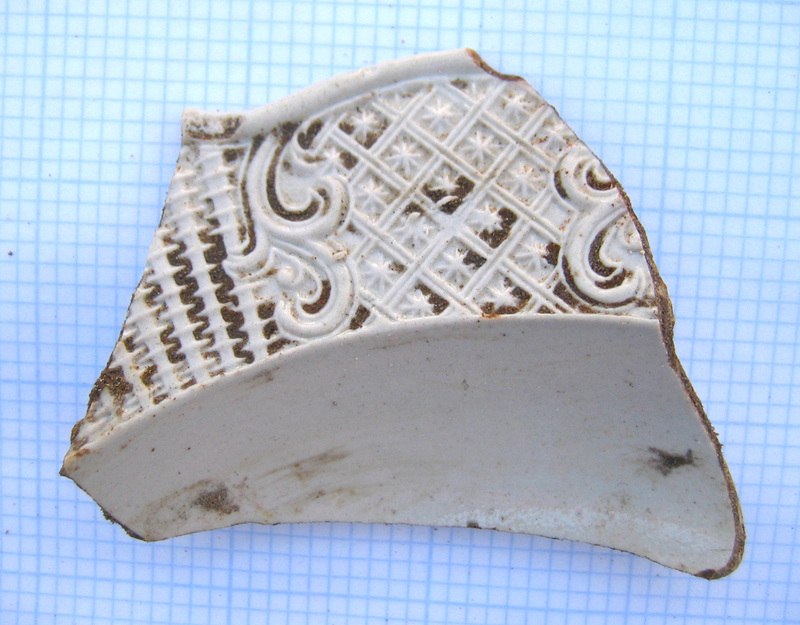 These ceramic objects, imported by ship from Europe, display some of the most interesting colors and patterns. It’s so rewarding to pull these little gems from the obscurity of the dark soil! No clue on the hole in the wall. Seems awful low to be used as a support for scaffolding. I wonder if the hole is pretty clean in the brickwork or looks like bricks were removed to create it? 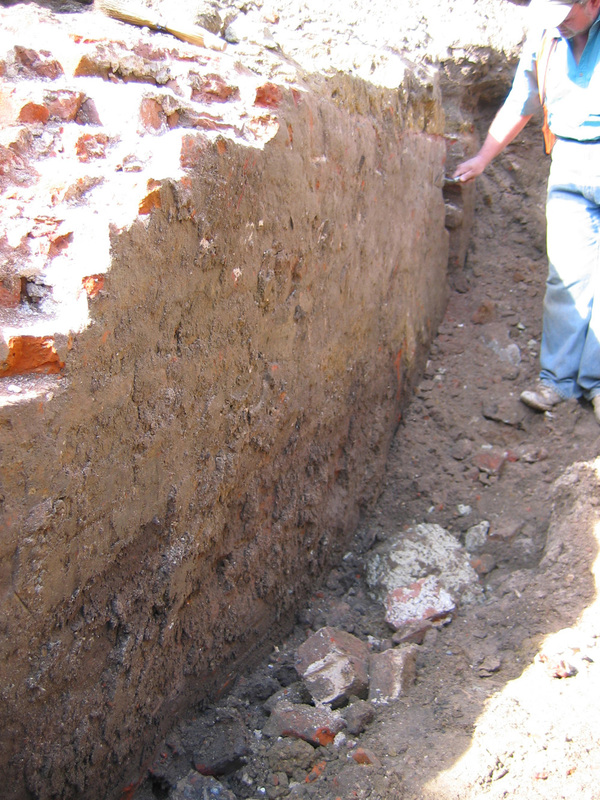 John, It appears that the cavity was created after the brickwork was laid. The bricks exposed on the inside of the hole are not smooth and clean, and the western face of the cavity (on the right if you’re facing it) is an inch or two wider at the back than it is at the front. Can’t tell if that anomaly was created on purpose or by accident. Perhaps it’s some sort of mortise for an unknown tenon. You’re probably as close to the truth as I can guess. Interesting to speculate what the unknown tenon might be!